Whether you’re just starting out on guitar or have been playing for a while but need a little guidance, tabs are quite handy. Tabs lay out what frets you should be playing by showing you the fret number on the corresponding string. They are an easy way to learn songs on the guitar. The problem with tabs is that they are often crowdsourced – meaning a user took the time to figure out a song and then made a tab and uploaded it to a website, such as Ultimate Guitar. It’s awesome that these websites and this culture exists, because it gives people an easy way to start learning songs. That said, when you’re learning a song by ear, there’s always a chance you’ll get it wrong. Many guitar tabs suffer from inaccurate interpretations of songs. I would like to give you a few suggestions for places to find good quality acoustic guitar tabs. Some of them are free, others require payment. 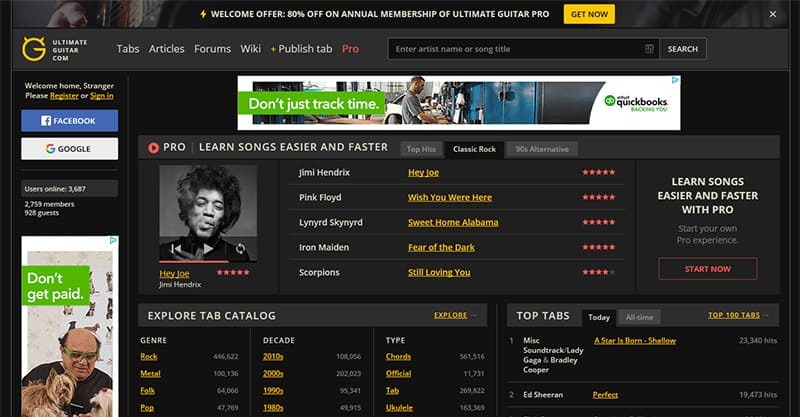 Here are some of the best guitar tab sites on the web. Let’s get going. You can’t make a list of guitar tab websites without mentioning Ultimate Guitar. They are the oldest and most comprehensive guitar resource on the internet. They have over a million guitar and bass tabs and usually have freshly released material up and tabbed quickly. 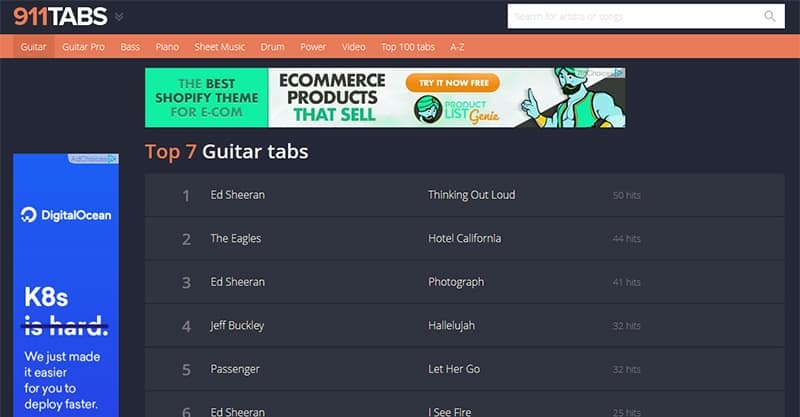 Ultimate Guitar is made up entirely of user-generated tabs, and their tabs have a reputation for being somewhat inaccurate or at least inconsistent. Check for versions of the tab that have a higher star rating and the most reviews. If you find things aren’t sounding right, check the comments. Somebody else probably thought the same thing and figured out the correct chord or fret to play. 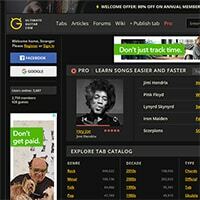 Ultimate Guitar is free to use on your computer but their mobile app must be purchased. The mobile app is quite good though – it has auto scrolling and is formatted to fit on a phone screen. 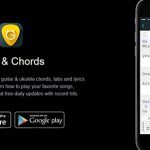 Songsterr is a more modern version of Ultimate Guitar. It has a clean and modern user interface that makes it stand out from Ultimate Guitar. It also operates more like Wikipedia. Instead of having several different versions of the tab with different star ratings, it has one version. It’s still user-generated, and any user can edit the tab but the community can always revert these changes. The site has over 500,000 tabs, and I find them fairly accurate. It’s also free. It has a paid plan that unlocks the iOS and Android apps. The funds raised through the paid plan are used to pay artist royalties, so that the tabs aren’t removed. So, that’s cool! This tab site is unlike either of the aforementioned sites. It’s a hub that amalgamates tabs from all across the web. The creators of the site call it “Google, but smaller and more accurate”. And it’s just for guitar tabs. They’ve indexed over four million tabs. Using 911Tabs makes it easy to find a good tab right away, and it’s also good for finding tabs for obscure songs. 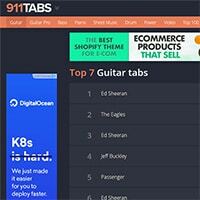 Your favorite website may not have the song, but if there’s a tab out there, 911Tabs can find it. The free websites are great because they’re convenient. That said, the more you dig in, the more you may be annoyed by inaccuracies. Sometimes, you want to nail a song or just save yourself the time spent finding sites, and rooting out any problems with tabs you find. In this case, you may want to explore a few of these sites. These tabs are usually created by professionals, and if they are not perfect, they’re at least very, very close, and laid out beautifully, with finger markings and rhythm notation. I most commonly use Musicnotes to purchase tabs and sheet music. It’s been around for a long time and has a large database of professionally created tabs. You can always see the first page of the tab for free, which gives you just enough of a taste. For every song in their database they offer a variety of arrangements and transpositions. There will often be tabs/sheet music for different released versions of songs (acoustic versions, live versions, etc.). Unless you subscribe to the site, every tab costs a few bucks. That might seem like a lot, but the tabs are great, which can save you a lot of time. One of the best places to find tabs is on Amazon. If you’re learning a lot of songs at once, consider just buying a book of tabs on Amazon. You can usually get a digital version for around $10, and a book of tabs will have anywhere between 10 to 50 tabs of a particular artist. There are also books of tabs that will tab out an entire album. On amazon, you can get a digital version, or if you’re into paper, get a paper version that will be delivered to wherever you are. Again, you can trust that these tabs are accurate and made professionally, because they are usually issued by music publishing companies. Sheet Music Direct is basically a warehouse of sheet music and guitar tabs. What makes Sheet Music Direct stand out is its straightforward interface. They have search categories that let you specify if you want regular tabs, tabs with a play along feature, easy guitar tabs, solo guitar, guitar chords with lyrics, lead sheets and more. Most of the tabs here are provided by major music publishers like Hal Leonard and Music Sales. Again, these are professional tabs and are almost guaranteed to be accurate. Most of the tabs cost between $2 – $6. If you subscribe to the site, you get a set number of tabs for free every month you stay subscribed. If you ever come across a song that doesn’t have a tab, don’t be discouraged – this is an opportunity. Relying only on tabs to learn songs is fine, but it doesn’t train your ear as much as learning and transcribing your own tabs. Not only will you be doing others a favor by contributing to the community, but you’ll also be training your ear to quickly pick out chords, notes and patterns. This makes you a better musician!